OK, by price jump, we meant more of a bunny hop. 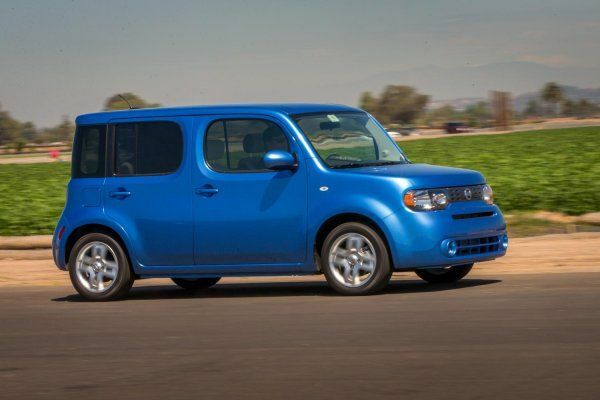 The 2014 Nissan cube sees a price increase of $20 over last year, all due to a rate increase for the destination and handling charges, which rise to $810 for the car. Starting manufacturer's suggested retail price is still $16,760, identical to the 2013 model year. As is the 2014 cube. On sale now at dealerships nationally, the 2014 cube has only one change from last year: color choice. Brown fans will be disappointed to find out that the Bitter Chocolate color option has been dropped in favor of a new blue Caspian Sea option to go with the other seven colors in the lineup. Interior colors remain unchanged, with Black or Light Gray as the two options there. The unique design of the cube is polarizing, but popular in urban environs, especially given the small box's superior handling and maneuverability in tight situations. Excellent visibility also remains thanks to that wraparound rear window and, well, cube shape, which allows for a wide angle of view. The cube remains a front-wheel drive car powered by its proven and popular 1.8-liter DOHC four-cylinder engine coupled to a six-speed manual transmission (standard) or optional continuously variable transmission (CVT). Fuel efficiency is 27 mpg in the city and 31 mpg on the highway with the CVT and slightly lower with the manual trans. Three trim levels complete the package of options, with two S-level base trims and one SL trim for added comfort and convenience. An optional Preferred Package can be added to the SL trim to put on fog lamps, a navigation system, larger touch screen, Rockford Fosgate premium sound, and more. Prices do not include destination and handling of $810.